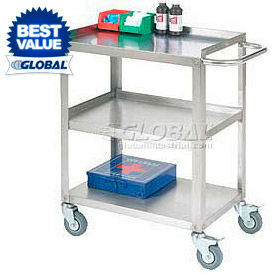 Stainless Steel Utility And Stock Carts Are used In Clean Rooms, Restaurants And Other Corrosive Environments. Stainless Steel Utility and Stock Carts are constructed with easy to clean and corrosion resistant tubular stainless steel for strength and long lasting durability. Variety of types available to meet job requirements. Rubber or polyurethane wheels provide mobility. Shipped ready to assemble. Available in a variety of lengths, widths, heights and wheel diameters/types to meet transport requirements. Shelf quantities are 2 and 3. Capacities are 200 lbs, 300 lbs, 400 lbs, 500 lbs, 700 lbs and 800 lbs. Stainless Steel Utility And Stock Carts - Welded Are Used To Store And Transport Heavy Materials And Supplies In Automotive Shops, Warehouses, Stock Rooms And Other Work Environments. 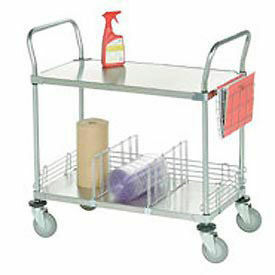 Stainless Steel Utility And Stock Carts are constructed with welded tubular stainless steel legs and shelves for strength and long lasting durability. Polyurethane casters provide mobility for user convenience. Easy-to-clean design for low maintenance. Available shelf quantities are 2, 3, 4 and 5. Capacities are 300, 500, 600, 700, 800, 1,000, 1,200 and 1,500 lbs. Dimensions and shelf types vary per model. 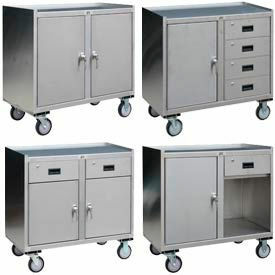 Stainless Steel Mobile Cabinets Are Designed For Use In Corrosive Environments Including Labs And Hospitals. Stainless Steel Mobile Cabinets are constructed with easy to clean and corrosion resistant, all welded 16 gauge stainless steel with premium #4 polished shelves for strength and long lasting durability. Variety of styles and drawer quantities available to meet job requirements. Includes lockable handle with 2 keys. Top work surface includes raised lip edges on 3 sides to help retain cargo. Stainless steel caster mounts with 5 inch polyurethane casters (2 rigid, 2 swivel) allow easy mobility. Available in a variety of styles and drawer quantities to meet transport requirements. Sizes are 18 in. L x 18 in. W x 35 in. H and 36 in. L x 18 in. W x 35 in. H. Capacity is 1,200 lbs. Color finish is Stainless Steel. Quantity is 1. NSF Listed Stainless Steel Utility And Stock Carts Are Used For Pushing Heavy Loads Or Transporting Supplies In Food Service Environments. NSF Listed Stainless Steel Utility And Stock Carts are constructed with welded tubular stainless steel legs and 14 or 20 gauge shelves for strength and long lasting durability. Stain and rust resistant shelves are reinforced with hemmed front. Bumpers on legs and handle protect walls and furniture. Easy-to-clean. Swivel casters provide mobility. NSF Listed. Available in a variety of lengths and widths to meet transporting requirements. Shelf quantities are 2 and 3. Capacities are 500 lbs, 700 lbs and 1,000 lbs. Quantity is 1. 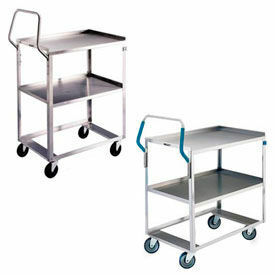 Galvanized Steel Utility And Stock Carts Are Used For Transporting And Handling Of Wet Items In Grocery Stores, Restaurants, Hospitals, Clean Rooms And Labs. Galvanized Steel Utility And Stock Carts are constructed with galvanized steel for strength and long lasting durability. Designed with two or three shelves specifically to handle wet items. Polyurethane wheels provide mobility. Types are Galvanized Steel Utility Cart 2 Shelves and Galvanized Steel Utility Cart 3 Shelves. Shelf quantitates are 2 and 3. Dimensions vary per type. Color finish is Gray. Quantity is 1. 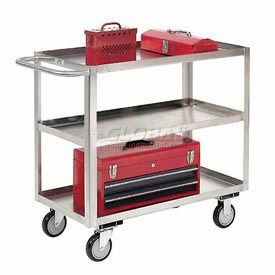 These Stainless Steel Welded Utility and Stock Carts make maneuvering in confined spaces easy. Ergonomic vertical handles offer more control when pushing heavy loads. Ergonomic designs helps to prevent repetitive motion injuries. 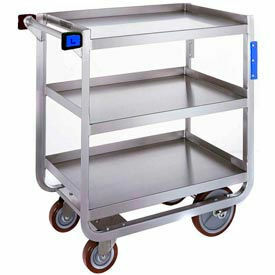 Stainless steel carts are rust and stain resistant feature reinforced shelves and a hemmed front. Top and middle shelf feature raised retaining lips on 3 sides. Easy-to-clean. Moves easily on swivel casters. 2, 3, and 4 shelf options available. Weight capacities range from 300 to 1,000lbs. 3-1/2", 4" and 5" casters available. Dimensions and shelf types may vary, lip up and lip down options available. Shelves are mounted at user-friendly heights. Stainless Steel Mobile Cabinet 2 Doors & 2 Drawers 36x18 1200 Lb.